If you’ve been charged with any level of DUI, the first thing you should do is consult with a criminal defense lawyer immediately. Laws surrounding DUI violations vary by state, and it’s important to know the details of what your up against as early as possible. Different factors such as repeat offenses, bodily injury, death, and age of vehicle occupants all affect how your charge will be classified. In the state of Nevada, misdemeanor DUI’s are most often given to first time offenders with minimal recklessness without injury to others or damages to property. 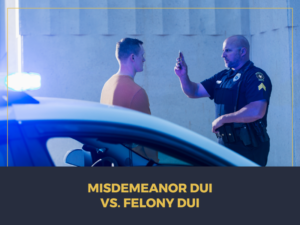 If this is a second offense, you could still receive a misdemeanor charge, but a third or more conviction is more likely to be charged as a felony. Felony DUIs are usually reserved for repeat offenders, cases in which people were injured or killed, and cases in which children were in the car when the arrest was made. A DUI resulting in the death or serious bodily injury of another person will most assuredly be charged as a felony and can result in up to 20 years in prison. With an experienced DUI attorney, you may be able to avoiding jail time if it’s only your second offense. Some states, however, do issue low-level felonies for second offense DUIs if they’re committed within ten years of the first offense. Most states, including Nevada, consider a third offense an automatic felony regardless of extenuating circumstances, and a fourth DUI is even more likely to be charged as a felony. Attorney Carl E.G. Arnold of CEGA Criminal Law in Las Vegas is an experienced and aggressive DUI/DWI attorney that understands the legal system and knows how to fight a DUI charge. Contact CEGA Criminal Law today for a free consultation.